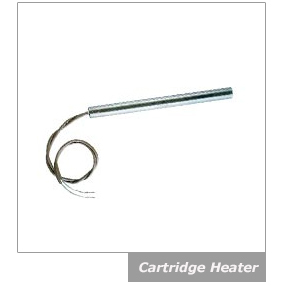 Cartridge heaters are most frequently used for heating metal parts by insertion into drilled holes. For easy installation, the heaters are made slightly undersize relative to their nominal diameter. At medium Watt densities, general purpose drills are usually adequate for drilling holes. Typically, these result in holes .003" to .008" over the nominal size of the drill, resulting in fits of .010" .015". Of course, the tightest fit is desirable from a heat transfer standpoint, but somewhat looser fits aid in installing and removing cartridge heaters, especially long ones. Holes drilled completely through the part are recommended to facilitate removal of the heater. After drilling, clean or degrease the part to remove cutting lubricants. At high Watt densities holes should be drilled and reamed, rather than just drilled to final diameter with a general purpose drill. At high watt densities, a close fit is important. The fit is the difference between the minimum diameter of the heater and maximum diameter of the hole. For example, at 1/2" diameter an OMEGALUX cartridge heater is actually .498" plus 000" minus .005". If this heater is placed in a hole which has been drilled and reamed to a diameter of .503" - .493" = .010"). OMEGA Engineering offers a wide range of cartridge heaters in Australia. The sensor for the temperature control is also an important factor and should be placed between the working surface of the part and the heaters. The temperature of the part approximately 1/2" away from the heaters is used in selecting maximum allowable Watt density from the graph. Control of power is an important consideration in high Watt density applications. On-off control is frequently utilized, but it can cause wide excursions in the temperature of the heater and working parts. Thyristor power controls are valuable in extending the life of high Watt density heaters, since they effectively eliminate on-off cycling. There are a variety of temperature controllers and sensors one can use depending on the application. One of the more popular sensor types for cartride heater applications are the surface mount temperature sensors. Thermocouple, RTD or Thermistors are available with an adhesive backing or the ability to be cemented to the surface being heated. There also bolt on and magnetic surface mount type temperature sensors available. Digital temperature controllers come in many different sizes with many output and input choices. Thermcouple and RTD inputs are the most popular with a dc pulse output. DC pulse ouputs allow the user to go to a larger relay to switch the heater load and use proportional control versus on/off control which can shorten the heater life. OMEGALUX™ CIR series high watt density cartridge heaters are especially well suited for use in applications involving molds, dies, platens, hot plates, and sealing operations. They are available in lengths from 1 to 24". OMEGALUX™ CIR series high Watt density cartridge heaters are especially well suited for use in applications involving molds, dies, platens, hot plates, and sealing operations. They are available in lengths from 2 1/4" to 48". OMEGALUX™ C Series heavy duty cartridge heaters are especially suited for use in applications involving hot plates, molds, dies, platens and container heating.